Emma Shevah, Kate Wiseman, David Baddiel and Julian Clary in the Fun Kids Book Club Podcast! Subscribe and download the latest episode on your phone or tablet! There’s two author interviews and two readings to sink your teeth into in the latest Fun Kids Book Club episode! First up, Emma Shevah chats to Bex all about her new book ‘What Lexie Did’ and her Greek-Cypriot family. Then Kate Wiseman is popping into the Fun Kids studio to update us on the latest in the ‘Gangster School’ series. We also have two brilliant readings from David Baddiel’s brand new book, Head Kid, and Julian Clary’s The Bolds in Trouble! 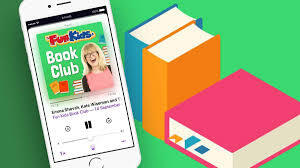 Remember that you can find out more about everything featured on the Book Club podcast right here on the Fun Kids website.